Maryland’s new gun control law will not head to voters now that organizers of a petition drive to halt the law failed to turn in any signatures before Friday night’s deadline. “This means there were no successful petitions this year,” Stephen Ackerman from the Secretary of State’s Office said in an email. A referendum would have delayed the gun law until after the November 2014 election, and the petition drive’s failure was welcomed by gun control groups. Yet a promised court challenge still looms from the National Rifle Association and other gun groups, a coalition that urged gun-rights supporters to avoid the petition and instead back legal action. Maryland’s new law, proposed by Gov. Martin O’Malley and signed in May, is one of the most sweeping responses to the December Newtown, Conn., elementary school shooting that killed 27 and sparked a nationwide push for tougher gun laws. Under the law, the sale of 45 different types of assault rifles will be banned, as will sales of magazines that hold more than 10 bullets and handguns that only accept such larger magazines. Handgun buyers will need a new license that requires fingerprinting a background check in Maryland’s newly bolstered background check system. More people – particularly those considered dangerous from mental illnesses – would be barred from gun ownership, and gun owners could face criminal penalties for not reporting lost firearms to police. 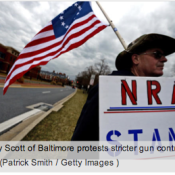 Post Continues: Maryland anti-gun control petition fails; NRA lawsuit looms – Baltimore Sun.